Margo Donohue of the Book vs. Movie podcast returns to help Patrick break up a wedding. Check out the Book vs. Movie podcast here and follow them on Twitter here. Wow wow wow wow wow at Patrick's audition story! I've watched it many times, and the last 15 minutes always leaves me in tears. HER FATHER OWNS THE WHITE SOX! This is not even a contest. For real. But where's the frikken Robin Ventura cameo? Not even a Harold Baines. I think Frank Thomas should've popped up in Soul Food. He could have given Mehki Phifer advice. That was fun! You guys thoroughly dismembered My Best Friend's wedding, something I didn't even knew I needed until today. I'll have to check out book versus movie. Also you're right about Roberts' and Cusack's chemistry, they definitely should've had a shot in a better and weirder movie. Does it help if I say I thought Dermot Mulroney was SUPER GORGEOUS back then? Another 1997 movie! I think I was mostly judging the characters based on their hair, appearances and costumes at the time. Julia Roberts wore skinny suits, smoked - which I thought looked cool - and had a thinner face, which were all things I wanted to do and have, so she was great in my anorexic 13 yo mind. Cameron Diaz had a wide face and wore PASTELS that looked like Charter Club, OMG. Yuck. Outside this film I never connected to Julia Roberts as an actress, though, whereas I quickly fell in love with Cameron Diaz in other films of the same era. I like Patrick way more than Chris Masterson! He is always going to be Dirty Steve from Young Guns to me. You guys...see the size of that...chicken? 1. I subscribed to Book V Movie in a flash after this. Margo is a damn delight and anytime you want to have her back, I'm on board. 2. This is the rare Chicago movie that acknowledges that a Chicago has a baseball team that is not the Cubs and I love it for that. 3. I kind of prefer Roberts movies where she is...not a perfect little romantic saint and this is a good example of that. Gimme a movie where she gets to have some bite, like Confessions of a Dangerous Mind or Normal Heart and so on. But Lordy, she is a monster in this one. She almost pulls it off though! 4. Sing-along scenes can all go to hell. I love having Margo on. She always has a great perspective and gets as worked up about stuff as I do. Here's my thing with Rain Man. I think Tom Cruise is excellent in that movie. Really good performance, underrated. The rest of the movie is what it is. 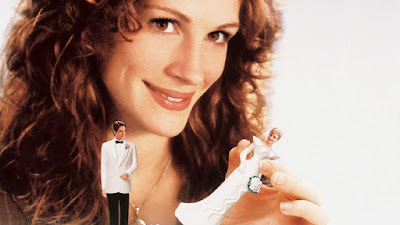 I kind of wish you had thrown Julia Roberts's other 1997 movie into the mix. Would love to hear your thoughts on Conspiracy Theory! Completely agree on Tom Cruise in Rain Man. Forgot all about Conspiracy Theory. I liked that movie in 1997 but I suspect it wouldn't work for me now for a host of reasons. So glad I'm not the only one who noticed how violent TM7 is for a PG-13. Not complaining in the least, nor am I playing morality police and am not judging whatsoever -- it's just something I couldn't help but notice. Amazing to me that it didn't get an R.
Soooo I should watch Julia Roberts and Dermot Mulroney in this to prepare for turning 28 in a couple weeks? Adulting!!! I simultaneously liked and disliked this movie. I liked how touching and funny this movie was. But I just hated Julianne and how selfish she was. She could easily destroy the relationship of her best friend and his love just because she was just jealous of his new girlfriend. Recently, I was at the wedding of my best friend and thanks to https://www.weddingforward.com/maid-of-honor-speech/ I could write a wonderful speech. And now I think about how it would hurt her if I had thought of doing something like that.